When you bring value to customers and care for your clients, you’ve taken an important first step toward generating business referrals… without asking. Stacey Brown Randall considers herself a contrarian in the sales world, because she believes that if you’re asking for referrals, you’re doing it wrong. She helps small business owners and solopreneurs generate referrals and she dispels myths about referrals. 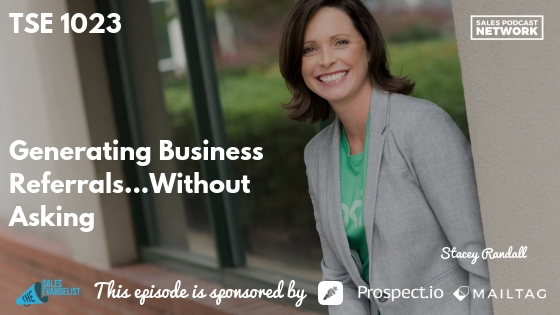 She didn’t set out to focus on referrals, but after her first business failed, she discovered that business owners have to figure out how to touch business development every day. You also have to figure out the ways in which you’re willing to do it. Sellers have countless options for bringing in clients and prospects to their pipelines, but they have to be options that the sellers are willing to do day-in, day-out. When her own business failed, she asked herself what went wrong. Although there was more than one mistake along the way, she realized that she never figured out how to fill her pipeline consistently. She never found an activity she was willing to do on a regular basis. She researched and found that referrals offer an amazing way to bring in clients, and they’re often quicker to close. They also trust you before they ever meet you, and they are less price sensitive. Everything about referrals is just better. Stacey was determined to figure out the referral piece when she launched her second business, but all the information she could find said you had to ask for referrals. To her, asking for a referral felt like a second-cousin to a cold call. She didn’t want to do it. 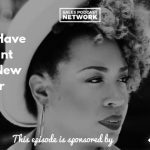 In order to help her second business be successful, she decided to figure out how to generate referrals without asking. Once she did that, she moved into teaching other people how to succeed in the same way. Referrals are not about you. If you ask for them, or make them part of your marketing plan and develop promotions around them, you’re making the referrals about you. Stacey discovered that the sales process has three buckets: prospecting activities, marketing activities, and referral activities. What we do to generate referrals looks different than what we do compared to prospecting and marketing. When I’m in prospecting mode, I’m looking for someone who will say yes within 30 days. With marketing, it’s a little more long-term but there is always an ultimate mindset. Referrals, however, require different activities and a different mindset. The biggest mistake people make is treating their referral process like part of the prospecting effort. Or, they think about it like marketing and make it promotional and gimmicky. If you’re going to hand off the client at some point, you have to make sure it’s a great process and great client experience. Nobody refers to crappy work and no one refers a choppy customer experience. That’s a foundational piece, and none of these suggestions will work if you aren’t referrable. You must do the things that make people want to refer you. The most important person in a referral process isn’t you and it isn’t your prospect; it’s your referral source. You must understand who is referring you. You may have this information in your CRM, or you may have to do some digging. Determine who those people are that already referred you in the past, and begin there. You’ll likely realize that you don’t have that many, and you’ll probably discover that you haven’t been intentional about building relationships with those people. Figure out what you’re doing to take care of your referral sources. Because sellers often get paid on commission, it’s tempting to move quickly from one client to the next. Sometimes sellers don’t recognize that it’s a lot of work to constantly seek the next big win. Instead, sellers can spend their time doing activities they enjoy doing for people who know that they truly care. Then, the sellers can watch clients drop in their laps. It saves a tremendous amount of time and money. No one wakes up in the morning thinking about ways to make your job easier. They aren’t thinking about how they can refer you. 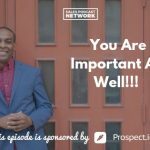 Your job is to make sure that you’re doing outreach to referral sources and that you’re being memorable and meaningful. You want to use the right referral seed planting language so that you move into their subconscious. When you take care of people, they naturally want to take care of you back. We want to be the person who is constantly giving to them so they think about us in a different way. When an opportunity arises, we want them thinking about us. It’s all about how we take care of people. When you know who your referral sources are and you focus on them, you start to notice and develop patterns about those sources. When Stacey was a business and productivity coach, she noticed that her niche happened to be working parents. Their world was her world. Her previous business failure gave her a unique perspective she could share. She initiated a touchpoint that included “off-guard holidays.” In order to be meaningful, she sent Mother’s Day and Father’s Day gifts to her top referral sources. She sent a Wonder Woman water bottle to the moms reminding them that they are heroes. It didn’t include Stacey’s logo and it wasn’t about her. It was about her client. Those clients have never forgotten who sent that bottle. They were seen and recognized. That effort can’t be a one-and-done. The touch points must accumulate over time. Clients will always think about you in return when you’ve thought about them first. Anything you do must be all about them. Begin by using the word referral when you’re talking to your clients. When someone sends you someone, send them a hand-written thank you note that thanks the referrer by name. It’s noticeable because it’s a thank you note that you took time to write. Be honest, but plant the idea of referral. The seed may not always fall on fertile soil, but eventually, it will. Aim for the 30 percent who will actually refer you. Like the other steps, it must be a consistent effort that builds on itself. We’re seeking to create a habit for how our clients will behave. You can connect with Stacey at staceybrownrandall.com where you can figure out your skill level at generating referrals by taking her Referral Ninja Quiz. The quiz identifies three different levels, and it will help you determine whether you should learn more about referrals. Her website includes all kinds of free content to help you figure out how to move to the next level.